The amphibian that can regrow their lost limbs. They’re quite remarkable and it makes you wonder what do salamanders eat? What does this outstanding reptile include into their diet? What makes them differ from the Iguana or Bearded Dragon? Well they eat different things varying on their adaptation either to the wild or as pets. In the wild, what they eat depends on the food-web, but as a pet they eat what their given (if they like it). In the wild, as mentioned just previously, they rely on the food-web to determine what they eat. The salamander loves being in the water and that also plays an effect in what they feast on. On land they’ll eat things that are different than the marine-life they’ll eat as they spend their time in the water. As they’re in the water they may decide to eat tadpoles, small fish, frogs, and other small things that are near them. When they’re on land they may eat eggs (from frogs or other insects), a variety of insects including (but not limited to): spiders, worms, dragonflies, centipedes, and slugs. What about when they’re young? 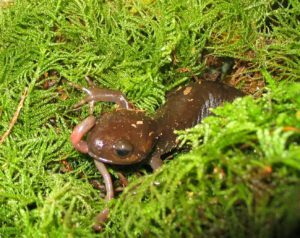 What do baby salamanders eat? When they hatch out of their egg, their meal for about a week is the eggshell they cracked out of. They will feast and grow from the nutrients provided from their eggshell for about a week. After that they will have grown enough to eat small organisms until it’s grown into an adult. What Should I Feed my Pet Salamander? If you own a pet salamander then you may have realized they’re not hard to feed. They’re similar to other lizards in terms of what they eat, even as pets. They’re preferences consist of insects such as the Horn-worm or mealworms. They’ll also consume crickets, earth-worms, and other insects. Their appetite is huge enough for many insects. Your pet salamander may be even easier to feed after reading this article by Alicia-Online!